Manufacturer sales for the professional salon industry’s appliances category grew 5.2% in 2014, according to the new 2014 ProfessionalSalon & Pro Beauty Industry Appliances & Shears Study from Professional Consultants & Resources, the U.S. salon and professional beauty industry’s leading strategic consulting, market intelligence and data research company. That rate is 65% greater than the overall salon industry’s growth rate of 3.1% for the same time frame. Sales to the pro beauty and gray market posted lower growth at 2.8%. This comprehensive, 80-plus page study reports on sales of professional hair dryers, curling/flat/styling irons, trimmers, clippers and shavers to professional salons and stylists, Sally Beauty and gray market outlets. It also includes a complete section on shears, and covers major trends and influences on the market, categories and segments. A 5-year historical and 5-year growth projection is included, along with market needs of both stylists and consumers. The study audits leading salon industry beauty store stocking by brand, manufacturer and price, while tapping the expert resources of veteran executives in the professional salon industry and salon appliances marketplace. Note: On a pure styling appliances play basis, excluding shears, clippers and trimmers, FHI Heat, Cricket and T-3 Micro make the Top 10 list. Professional channel curling and flat iron sales grew at 6.3%; blow dryers grew 3.2% and clippers/trimmers at 3.7%. Important growth factors affecting the appliance market were the continued demand for curling and specialty irons, along with the continued strength of flat irons, plus newer technologies introduced into the market. Growth in chair and suite rental salons contributed to sales at Beauty Systems Group/CosmoProf, SalonCentric and other full-service distributor stores. Rentals are the fastest growing industry segment and use the newest hard goods. Continuing gray market diversion accounted for 25.8% of all appliance sales, with “exclusive” salon lines now available at QVC, Ulta, Sephora, Target, Bed Bath & Beyond and other mass and department store retailers. New product features, resulting in higher prices, offset lower, base-model pricing. Farouk (CHI Brand), which ranked sixth in overall professional distribution and third in styling appliances, partnered with Kardashian Beauty. The study reviews Andis, Wahl, Oster and BaByliss/Forfex, the market leaders in the clipper/trimmer category. 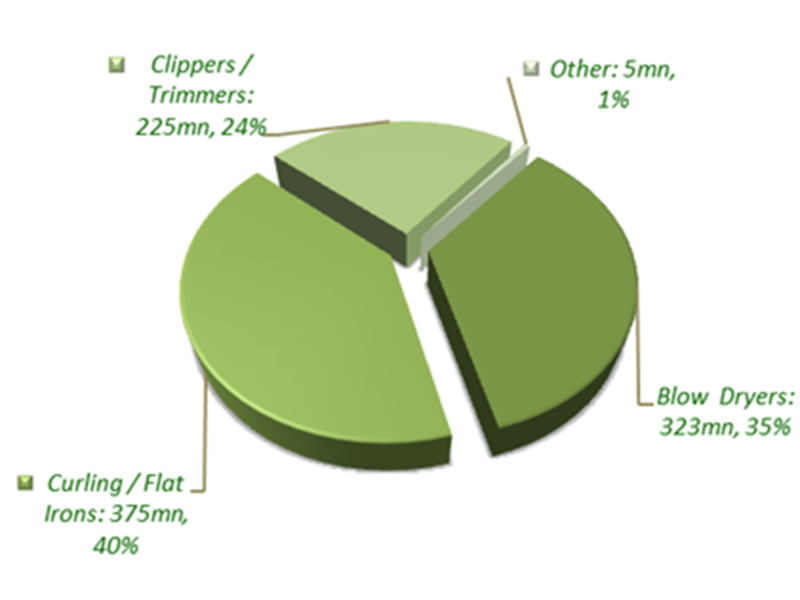 The 2014 study features an in-depth category report on the professional shears market. Trade advertising data for appliances and shears are reported in depth, along with an analysis of 2014 promotions. A special section reveals market shares and significant changes for top companies and names more than 130 North American brands. For purchasing information or questions, contact Cyrus Bulsara at [email protected] or go to www.ProConsultants.us.